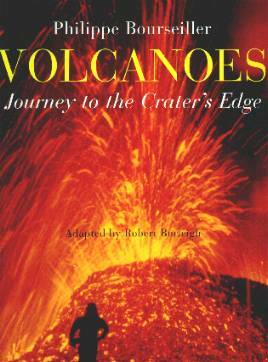 Although essentially a juvenile book, with fun illustrations and fantastic photographs, this book by Philippe Bourseiller will appeal to volcano enthusiasts of all ages. It readily explains how volcanoes occur and takes us on a trip around the world showing us mind-blowing pictures of all types of volcanoes. This is an easy tool for children to learn about them and also about the photographer's observations of the people and places he has visited around the world. It's like a story book for older children, and adults, that will hold your fascination. Sometimes, I find books like these too technical for the layman but this one I found I actually understood and learned things. I loved the little stories about the various countries, the illustrations, and the various people who inhabit the areas close to volcanoes. Who knew there were red and gray volcanoes? This book would make a great gift for the holiday season - it's large and could even be a coffee table book. You'll go from volcanic Iceland to Kenya, Ethiopia, Vanuatu, Japan, and more. This makes learning fun - for everyone. Conclusion - Stunning photographs and extremely interesting.